There is so much to talk about in the way of hurt and heinous acts. The climate is heavy, and our shoulders are sagging just a little. We continue to talk about it, the absence of peace and the presence of hate, but what if we listened for the voice of peace? My favorite song of the season is “I Heard the Bells on Christmas Day”. I’m a writer of words, but more than that, I am a lover of language. We always have multiple choices for the ways we want to say something, and Longfellow beautifully penned these words during a time of tragedy and personal loss. There really is no reason for me to repeat or revise his words here. He wrote this in 1863 and it is still so fitting today. He rested in the hope that the right will prevail—and so can we. In the way of good will to men, I have a story from Christmas just a few years ago. I had a two-day work event. I was a busy (tired) working mom, and I was going to be gone overnight. On a school night. The idea itself was daunting, but I was going to power through and be both a responsible mom and a loyal employee. So I packed my clothes and gathered my tools for the event, and off I went. Because I was setting up a dinner, I needed to be there early and would have to get ready in a tiny little bathroom, but that was just part of the charm. My mom was with me, because we work together (also part of the charm). I slipped in to my suit jacket with grace and elegance, and then to my shock, there were no pants. NO PANTS. I cannot go to dinner without pants. “MOMMMMMM!! !” I cried, as my blood pressure started to rise, “I don’t have any pants.” We had a meaningful discussion at this point, and she brought me the dress, which was not meant to be worn at dinner, because it was a little fancy, but thems the breaks. Crisis averted. At dinner, sitting with the precious people I was hosting, I felt that I owed an explanation for my fancy self. They are all sitting in their slacks and Christmas sweaters adorned with sparkly stars and velvet poinsettias, and I’m in my fabulous purple dress. “I don’t have pants,” I explained simply. Because, well, how else can one explain the absence of pants? (this is where you need to pay attention). One of the ladies said, “You don’t have pants? Well, do you want mine?” – because LOVE WINS. LOVE.WINS. I did not take her pants. Had I taken those pants, which were so graciously offered, my friend would not be wearing any pants. You see how this works…. But either way. She was willing. We became better friends after that. I just adore her. And she always compliments my pants when she sees me. It’s our thing. There was plenty of hurt around that table that night. I was anxious about my clothes, but there was so much more than that. One of the ladies had a son facing heart surgery; one of the couples was about to start a fight against cancer; one of the men was fighting alcoholism; one of the ladies was in an abusive marriage. I have no idea what we ate for dinner that night. I don’t remember the program after dinner. I remember her kindness in the midst of the struggle. Maybe you don’t offer your pants, or your shirt, or coat. Maybe you offer a meal, or something sweet to snack on, or a warm drink. 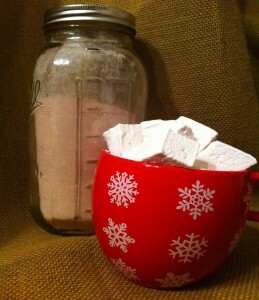 One of my favorite gifts to give (because it’s cute and inexpensive) is this cocoa with home-made marshmallows. Combine all ingredients in a large bowl, incorporating all parts well. If you’re me, you leave this in a humongous sealed container and use it all up by yourself. But this isn’t about me, its about giving and love and charity…. So instead, you might put it in smaller sealed containers and distribute to friends with instructions for mixing: ½ C mix, ¾ C boiling water in a mug (topped with marshmallows, clearly). Ok. This is long, but it’s not hard. Stick with me. Don’t be overwhelmed. These babies are so light and delicious it is totally worth it – and actual time involved is minimal, though they have to sit at least 4 hours or overnight. In the bowl of the stand mixer, place ½ Cup of ice cold water and all 3 packages of gelatin. Let sit. Don’t mix just yet. In a sauce pan, over medium heat, combine the remaining ½ Cup of water, salt, granulated sugar and corn syrup. Cover and let this mixture heat up for about 4 minutes. Take the lid off and clip a candy thermometer to the side and cook for another 7 or 8 minutes, stirring occasionally, allowing the temp to raise to 240 degrees F. Remove from heat immediately. Place the whisk attachment on your mixer, if you haven’t yet, and turn it on low to start mixing the gelatin and water. Slowly pour the hot sugar/syrup mixture down the side of the bowl while keeping the mixer on low speed. When all of the syrup is in the bowl, continue whisking but raise the speed to high and allow to mix for about 15 minutes. Add the flavoring extract in the last minute of mixing. The handy thing about a stand mixer is that you can walk away and spend your time in a productive manner as it whips your mixture for you. Isn’t that considerate? So, while it’s mixing away, combine the powdered sugar and cornstarch in a bowl and prepare the 9×13 dish in this way: spray with cooking spray then dust the bottom and sides with powdered sugar mixture, return the remaining mixture to the bowl to be used later on. When the stand mixer has finished its 15 minutes of work, and you have a fluffy sticky mess, spray your spatula with cooking spray and ease the marshmallow mixture into the powdered dish, spreading it around evenly. Give the top of this loveliness a coating of the powdered sugar mixture – you will still have a good bit left for later, keep it in a covered bowl, you will use it up. Don’t cover, but let the marshmallow mixture sit for at least 4 hours – finish up with your shopping, or, if it’s anywhere near a reasonable bedtime, go to sleep. When the allotted time has passed, flip the dish over onto a cutting board and use a pizza wheel (which you have responsibly coated with the reserved powdered sugar mixture) and cut into squares, not bigger than 1 inch or so. **you can also use cookie cutters at this point if you want the marshmallows in a fancy shape such as a snow flake or star or whatever makes your skirt fly up. Coat all the cut up marshmallows in the remaining powdered sugar mixture –lightly tossing them in a bag is the most efficient way I have found to do this. Lay the marshmallows out to be distributed appropriately if you are giving them to friends – they will store in any air tight container for about 3 weeks.